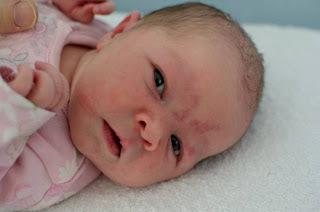 Wecome to Poppy Eloise, born in her caul! Poppy Eloise was born on 1 February at 7.39 weighing 7lb 7oz. The labour was a very slow start and it took 30 hours to get to 4cm. I was having 3 contractions in 10 minutes and Bracken was busy so went straight to labour ward. There was no one on reception and we were messed around a bit and so everything stopped for a few hours. This was really a blessing in disguise because by the time I was 4-5cm Bracken was free. I went in the pool at 5.00am at 4-5cm and Poppy was born at 7.39am. The pool was amazing and I felt like a different person as soon as I got in the water. I had gas and air until I got the the final stage and then I had nothing. It was amazing how instinct took over and I said to the midwife "the baby is coming" flipped over (I was on my front in the water for the most part) and started to push. My waters had not broken when Poppy came out so the midwife broke my waters when she born. I then got out of the pool and lay on the massive bean bag with Poppy skin to skin on my chest. My midwife (Mandy) was amazing and understood the type of birth I wanted. The after care in Bracken was excellent and we were allowed to stay as long as we wanted. We stayed until about 5pm because I wanted to get a few feeds in before leaving. Breast feeding is going well and Poppy is back to her birth weight within a week. Thank you for all of your help in the classes - had I not been I would never have thought of going for a water birth. Elfie Joy was born on Thursday 6th January - she was 4 days overdue and weighed 7lb 11oz. As predicted, my labour was short and this time without any intervention. Elfie was born in the water at 10.39 am. I woke up at 6.30 am and was feeling a bit uncomfortable, was having regular, serious contractions by about 8.00 am, arrived in the labour ward in Exeter at about 10.00 and managed to get into the pool at about 10.35 having been examined and found to be fully dilated (really just in time!) - 3 good pushes and it was all done. I managed with breathing and my tens machine and did not require any stitches. We did request delayed cord clamping which was fine, I ended up not having a natural third stage as we were still waiting an hour after the birth and the midwife was keen to see the placenta so we went with the injection (after the threat of a catheter to empty my bladder!) I was discharged the same day. All in all I could not have asked for a better birth experience and the water birth was lovely. I know that the yoga had a positive effect on the whole thing, particularly the breathing so thanks very much.